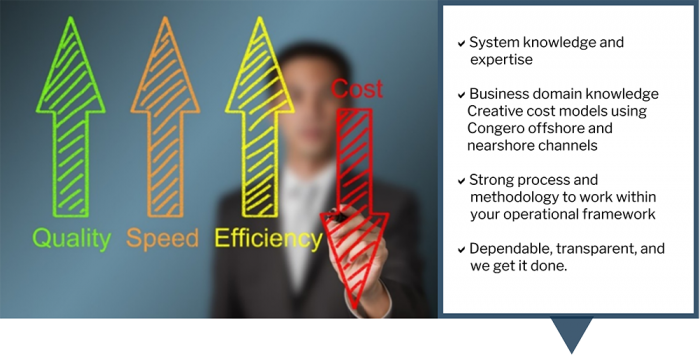 Congero Application Management Services (CAMS) does more than traditional system administration. We work with your business operations and IT teams to implement new features and enhancements that accelerate time-to-value. We provide high-value application management services for Congero Cloud Services and the Oracle Communications Suite of products because we believe in supporting the full lifecycle of our innovative systems—helping them operate as efficiently and incident-free as possible. In a digital economy where critical business applications run in the cloud or in a secure data center, you need applications that can meet the fast-growing needs of your business. Setup a meeting today to learn how we can be your CAMS team.